Never run out of freezer space when you invest in a commercial walk-in freezer from CKitchen.com. These high-capacity freezers are uniquely designed to keep large volumes of food and beverages at their optimal temperature year-round, ensuring that you never lose money associated with food waste or storage issues. Walk-in freezers from CKitchen.com come in a huge assortment of insulation and skin types, all of which promise more efficiency than your old model with fewer costs associated with maintenance and health department regulations. You always get the guaranteed lowest prices plus free shipping when you partner with us. What’s so great about our selection of walk-in freezers is that many don’t require installation from a refrigeration technician. Because the best refrigeration brands — Kolpak, Master-Bilt and Nor-Lake — are now producing walk-in freezers that you can easily assemble yourself and take advantage of quick shipping. We offer units that come with either a packaged or remote system. What’s the difference? The packaged system requires no HVAC technician, whereas the remote system requires an HVAC technician for connection. Remote installation helps reduce hot air from blowing into the unit, which can compromise efficiency and reduce comfort for employees. We have the perfect walk-in freezer for your unique space and needs at CKitchen.com. We sell walk-in freezers with or without a floor, which can help you create a custom unit that’s tailored to your budget and personal needs. 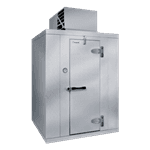 Floorless walk-in freezers are a good option for food service businesses with a concrete pad that meets local health department regulations. However, if the concrete is too thin or doesn’t hold up to local codes, you’ll need to choose a walk-in freezer with a floor. If all of this sounds overwhelming, don’t fret. CKitchen.com is staffed by a team of commercial kitchen equipment experts, so we can always guide you towards the right unit.